Sri Chinmoy saw the New Year as an opportunity to make great progress and would often give specific New Year Messages for the coming year. This extract expresses some of his philosophy about the potential of the New Year. 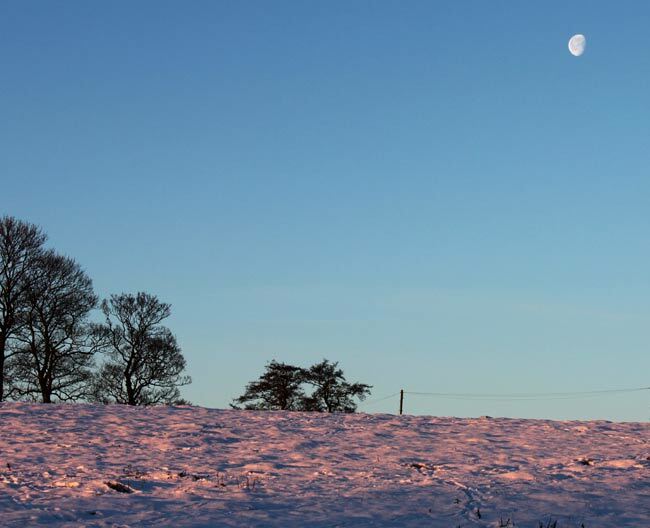 “On the eve of the New Year, a new consciousness dawns on earth. God once again inspires each human being, each creature, with new hope, new light, new peace and new joy. God says, “The New Year dawns and a new consciousness dawns within you. Run toward the destined Goal.” We listen to God, to the dictates of our Inner Pilot, and we run toward the ultimate Reality. The New Year energises us, encourages us and inspires us to run toward that ultimate Goal. Last week Kailash Beyer from the Sri Chinmoy Centre in Zürich, Switzerland, travelled to Brazil to offer lectures and meditation classes. He gave four talks in four different cities: Manaus, Sao Paolo, Rio de Janeiro and Niteroi. 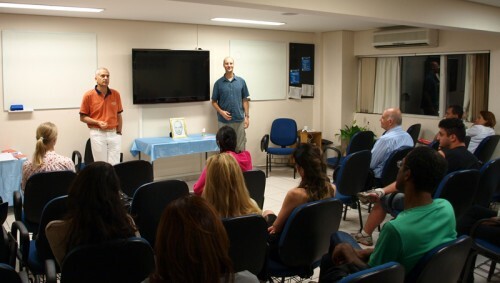 A lecture of Kailash (left, orange shirt) in Sao Paolo. Kailash’s talks revolved around the transforming power of meditation and the importance of having a spiritual master to guide you on the inner journey of self-discovery. Kailash has been a student of Sri Chinmoy for over 30 years and has travelled the world to share Sri Chinmoy’s spiritual philosophy with seekers of all walks of life. Question: How can we learn to meditate? Sri Chinmoy: The best way to begin to learn how to meditate is to associate with poeple who have been meditating for some time. These people are not in a position to teach you, but they are in a position to inspire you. If you have some friends who know how to meditate, just sit beside them while they are meditating. Unconsciously your inner being will be able to derive some meditative power from them. You are not stealing anything from them, but your inner being is taking help from them without your outer knowledge….. Staying productive right into old age. Be a child at heart. “If you can feel that you are not thirty or forty or fifty years old, but only seven years old, you will be able to discard so many of your bad qualities in the twinkling of an eye…every day you will see your life in a new way and your sweet, sweeter, sweetest qualities you will be able to bring forward once again.”  Children have that wonderful quality of not nursing grudges or disappointments and seeing newness in everything. Think about it; how many times as a child you played with your favourite toy or watch your favourite videos; whereas as an adult we get bored of everything after one or two uses. Regaining these childlike qualities will help us have new and beautiful experiences no matter what age we are. Keep up a sense of discipline. No matter what age we are, we still have to practise daily to reach our goals. With a doable learning curve and a well-thought out schedule, anything is possible. Again the difference in the mind’s and heart’s perspectives comes into play here: With the mind’s jaded viewpoint, it can be very easy to regard discipline as something painful and monotonous, but like Pablo Casals you can instead view it as a chance for progress. Aim for progress rather than for success. Focusing on an external result (which might be beyond your control) can be frustrating if things don’t happen according to plan, whereas it is much easier to get joy from progress on a day-to-day basis. Success is often taken to mean a big result, whereas progress can lie in simple things like even persisting despite the odds. 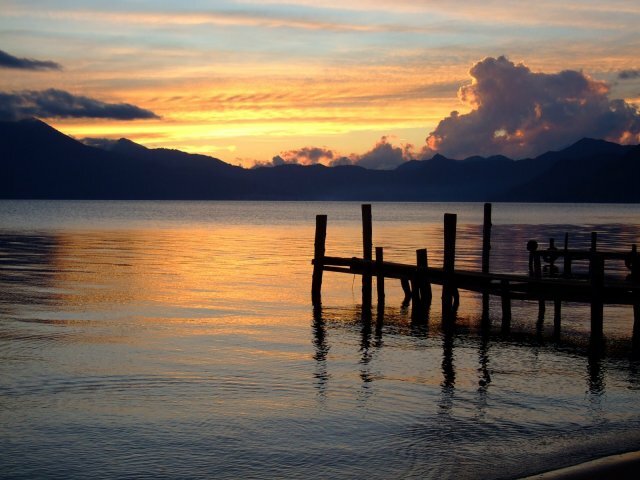 Author Nirbhasa MageePosted on June 10, 2007 October 5, 2011 Categories Philosophy1 Comment on Staying productive right into old age.